In December 2017, President Donald Trump and the Republican Congress enacted legislation providing large tax cuts overwhelmingly weighted to corporations and the wealthy. By draining federal revenue, the tax bill will increase deficits by an estimated $1.5 trillion over 10 years. Congressional Republicans have been loath to discuss how they plan on paying for these massive giveaways. But the president’s budget, released today, reveals how the Trump administration proposes to pay for the tax cuts—and the picture is not pretty. Trump’s budget would cut $675 billion from federal health care spending over 10 years by repealing the Affordable Care Act (ACA) and eviscerating the traditional Medicaid program, leaving millions fewer with health coverage. It would decimate education funding, making the most significant cuts in 30 years. It would cut programs that millions of Americans depend on to find a good job, keep a roof over their head, or put food on the table. It would also slash Social Security and other programs for people with disabilities. And it would severely cut public investments that are necessary for broad-based economic growth and a strong middle class. And as new polling by the Center for American Progress shows, this Robin-Hood-in-reverse agenda is the opposite of what the American people want. In 2017, President Trump and congressional Republicans made enacting massive tax cuts for corporations and the wealthiest Americans their top priority and forced their tax bill through Congress in December. By official estimates, the bill will increase federal deficits by $1.5 trillion over the next decade. The cost could top $2 trillion over 10 years, taking into account the permanent cost of expiring tax cuts (much of which is assumed in the new Trump budget), according to analysts, and interest on the additional government debt would add hundreds of billions more to the cost. The Trump-GOP tax plan was heavily skewed to large corporations and wealthy Americans, including massive corporate tax cuts that cost hundreds of billions; a special new loophole for pass-through businesses that predominantly benefits wealthy owners of such entities, including President Trump; and a reduction in the tax on multimillion-dollar estates. Millionaires will receive an average tax cut of nearly $70,000 this year—more than 100 times the size of the average tax cut for families in the bottom 80 percent of the income distribution. Most households will receive a tax cut in the near-term under the Trump-GOP tax bill, but those tax cuts are temporary—and come at a cost. All of the tax cuts for individuals expire after 2025, at which point the law results in a permanent tax cut for corporations and a permanent tax increase on most families. Perhaps more importantly, most households are made worse off by the tax bill when taking into account the cost of financing it. The Trump budget reveals just how painful the tradeoffs will be, proposing massive cuts to health care, education, and numerous other priorities—an agenda that the American people reject. The Trump budget, once again, proposes to repeal the ACA, including the tax credits that help millions of Americans afford health insurance and the Medicaid expansion that extends coverage to millions more. The Trump budget’s approach is modeled after the Graham-Cassidy bill, which would convert the ACA’s health care funding to a block grant that would shrink over time. Despite the yearlong efforts by Trump and congressional GOP leaders, ACA repeal fell short in Congress last year. The Trump administration, however, continues to attack the law through other means, including using executive authority and federal waivers to the states to undermine Medicaid and the ACA’s marketplaces. The Trump budget also goes beyond ACA repeal to eviscerate the traditional Medicaid program. Ending the traditional Medicaid entitlement funding structure, the budget would ask states to choose between per capita cap or block grant funding models in which federal funding would be capped on a per-beneficiary basis or per-state basis, respectively. As a result, federal funding would be significantly reduced over time, resulting in millions of people losing coverage as states were forced to roll back benefits and eligibility. Under this approach, federal Medicaid funding would be cut by at least $306 billion on net over 10 years; combined, ACA repeal and these Medicaid cuts would reduce federal spending for health care by $675 billion over 10 years. At the same time, the budget reaffirms the Trump administration’s intention to continue encouraging states to use federal waivers to impose harmful policies on Medicaid beneficiaries. These policies include premiums; lock-out periods that prevent beneficiaries who lose coverage from re-enrolling for months; and so-called work requirements that function as punitive time limits for unemployed and underemployed workers. 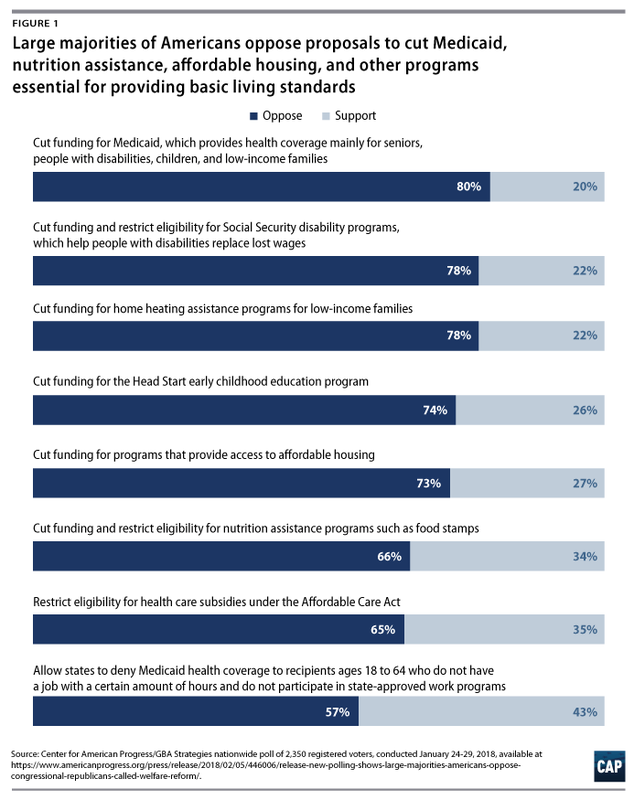 Furthermore, the budget would reverse an important ACA reform by allowing states to impose asset limits on Medicaid beneficiaries, which would act as a barrier to economic security by penalizing savings. Medicaid is a lifeline for millions of people—including veterans, people with disabilities, people struggling with substance misuse, and children—and policies such as these will make it more difficult for people to access the health care they need. The Center for American Progress estimates that if all states imposed work requirements in Medicaid, 6.3 million Americans, largely students and caregivers, could be at risk of losing their health care. Similar to last year’s budget, President Trump’s new budget proposes the most devastating funding cuts to the U.S. Department of Education since Ronald Reagan’s presidency. President Trump’s new proposal recommends completely cutting the Supporting Effective Instruction State Grants program (Title II) of the Every Student Succeeds Act (ESSA)—the federal program that provides more than $2 billion to states to recruit, prepare, and pay the teaching workforce. The $1.2 billion 21st Century Community Learning Centers program (21st CCLC, Title IV, Part B) of ESSA, which thousands of working families rely upon, is also slated for elimination. Trump proposed to end these programs last year, and, in a clear rebuff of his privatization agenda that would come at the expense of public school teachers, students, and families, Congress rejected that proposal. Despite this, Trump has yet again proposed to completely eliminate funding for Title II and 21st CCLC, for a total of $3.2 billion. What’s more, this year’s proposed budget would funnel $500 million in taxpayer dollars into private school voucher programs. This comes after the Trump-GOP tax bill created a special new tax break for wealthy parents by allowing tax-advantaged 529 savings accounts to be used for private school tuition. And while the unusual addendum appears to restore $3.3 billion to the education budget, Trump and DeVos have made their priorities clear. By, once again, proposing to slash funding for teachers and after-school programs, Trump is effectively recommending that Congress cut teachers’ salaries, increase class sizes, and cancel after-school programming to pay for tax cuts for wealthy parents who can already afford to send their kids to private schools. Meanwhile, working class families will bear the brunt of depleted funding for public schools. Estimates of how many teachers’ salaries in each state could be cut and how many students in each state would lose after-school programming as a result of eliminating funding for Title II and 21st CCLC are available here. President Trump’s budget decimates one of the United States’ strongest tools for moving people out of poverty—a college education. Trump’s new budget goes further than last year’s proposal and cuts about $200 billion from student aid programs over 10 years. Cuts to student aid would make it harder to afford the growing cost of college; weaken the repayment safety net for future borrowers; or eliminate the ability to attend college altogether. Specifically, President Trump’s budget proposes eliminating the subsidized loan program, ending the Public Service Loan Forgiveness program for new borrowers, and changing the terms of repaying student loans based on a borrower’s income. The subsidized loan program provides interest-free loans for students with financial need while enrolled in college. In 2016-17, more than 6 million students borrowed more than $23 billion in subsidized loans. Most of these students also received Pell Grants, which benefit low-income students. The Public Service Loan Forgiveness Program allows borrowers to have loans forgiven after making 10 years of qualified payments and working in government service or approved nonprofits. On top of cuts to loans, the proposal would freeze the maximum Pell Grant at its current level of $5,920 per year for the next 10 years. Pell Grants help almost 8 million low-income students pay for college. Today, the Pell Grant covers just 30 percent of the total cost of attending a four-year public college. As college costs continue to rise, working families need more student aid to pay for college—not less. And they certainly could use it more than the heirs of multimillionaires. Estimates of the amount of subsidized loans borrowed in each congressional district are available here and the impact of a Pell Grant freeze on college affordability by state here. President Trump’s budget proposes cutting or eliminating several programs that help workers gain skills and access employment services. The administration proposes eliminating the Senior Community Service Employment program, which provides nonprofit employment opportunities to low-income seniors; the Migrant and Seasonal Farmworker program, which aids farmworkers grappling with seasonal unemployment and underemployment; and the Indian and Native American national programs, which provides employment and training programs to low-income and unemployed Native Americans, among others. Additionally, the budget proposes a 30 percent cut to the YouthBuild program, a 23 percent cut to Job Corps, a 12 percent cut to the Wagner-Peyser Employment Service, and a 16 percent cut to adult education and literacy programs. The budget also discloses that the secretaries of labor and education are developing a plan to “consolidate and reorganize Federal workforce development programs” and that the plan will be unveiled as part of a spring 2018 government reorganization proposal. The announcement follows a June 2017 executive order in which President Trump announced that his administration would conduct a review of workforce development programs to assess their effectiveness, identify potential reforms, and identify programs that were either “ineffective, redundant, or unnecessary.” The executive order did not detail how agency heads should assess what programs should be eliminated—nor does the budget. The budget comes on the heels of President Trump’s lip service for investments in workforce development and job training in his State of the Union address and his recent praise of “vocational training”—as well as House Speaker Paul Ryan’s (R-WI) recent effort to rebrand congressional Republicans’ attempts to cut essential benefits for struggling families as “workforce development.” The administration has also proposed expanding apprenticeship programs, and the budget calls for a $200 million investment in apprenticeship programs, yet the available evidence suggests that Trump’s effort will involve weakening program standards, which could result in a proliferation of low-quality programs. President Trump’s budget lays bare that his calls for workforce development amount to little more than empty rhetoric. If the Trump administration truly wanted to ensure that more workers had access to quality training and workforce development, it would make investments in effective programs instead of attempting to reduce access to training and employment programs, a move that will most certainly come at workers’ and employers’ expense. Despite repeatedly promising to invest in the nation’s infrastructure, President Trump’s proposed budget calls for dramatic cuts to core federal infrastructure programs. The largest cut would be to the Highway Trust Fund, which provides essential funding for highway, bridge, and public transportation programs. 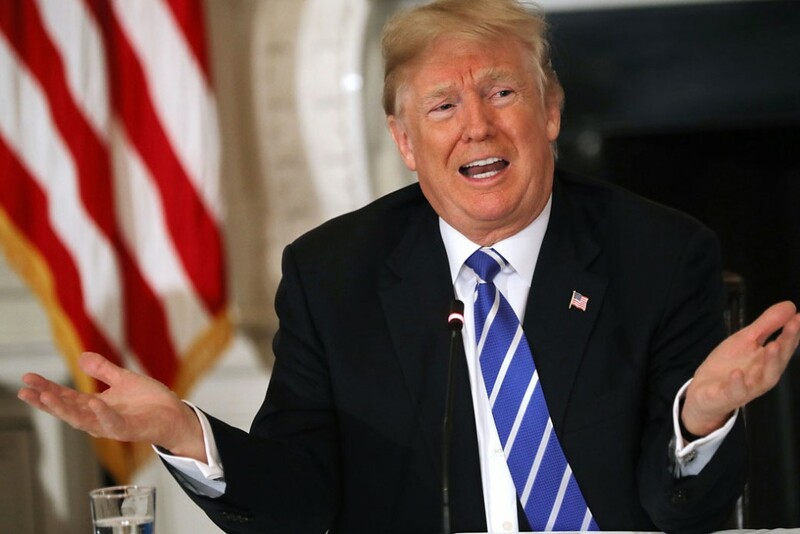 Extrapolating out from the most recent Congressional Budget Office analysis, the Trump budget proposal would result in a cut of $164 billion to the Highway Trust Fund over fiscal years 2021 through 2028. Funding cuts and job losses are broken down for each state here. Additionally, the budget calls for the immediate elimination of the Transportation Investment Generating Economic Recovery (TIGER) grant as well as pushing a substantial share of the cost of Amtrak long-distance routes onto states. The budget would also eliminate the Federal Transit Administration’s New Starts program—which provides significant funding to transit authorities for the construction of major new bus and rail projects—once all existing grant agreements are completed. Finally, the budget continues to push infrastructure privatization and private equity financing, stating that the budget is designed to spur “private infrastructure investment.” In short, the budget would take money away from state and local governments while, at the same time, pushing expensive private financing that will lead to higher taxes, tolls, and other user fees that disproportionately fall on working- and middle-class families. While a few wealthy metropolitan regions may be able to handle the burdens created by the Trump budget, thousands of other communities would simply be left behind as federal funds dried up. The president’s budget proposes to gut the programs that provide the last line of defense against catastrophic toxic contamination. The Trump budget proposes drastic cuts to the programs and offices tasked with monitoring and remediating toxic contaminants. In particular, it proposes a 25 percent cut to the Environmental Protection Agency (EPA), one of the most drastic cuts to any federal department or agency. (The Trump administration originally envisioned a 34 percent cut to the EPA but reduced the cuts in its budget addendum following last week’s budget deal in Congress.) The president’s budget proposes no additional funding to the Superfund program (though the initial budget request included a 30 percent cut), which facilitates and funds the clean-up of toxic waste sites like shuttered industrial plants, landfills, and mining sites. When done successfully, Superfund remediation can protect surrounding communities’ health and return the site to productive use. But Trump’s budget relies on settlement money from companies that violate environmental laws to fund cleanups, which would delay necessary cleanups all across the country or leave some toxic sites unmitigated. And although President Trump proposes to rely on settlement money to fund certain toxic waste cleanups, it weakens the EPA’s ability to enforce the very laws that would secure those settlement funds. Trump’s budget would eliminate some of the EPA’s enforcement programs, though it does not specify which. Instead, the proposed budget includes a provision “to specifically assist the oil and chemical industries in their compliance with EPA regulations” that would “institute a voluntary fee that can be paid by a facility to have EPA provide on-site compliance assistance.” This measure is a clearly intended to make it easier for industry to pollute and reduce oversight from the EPA. These drastic measures have the support of EPA Administrator Scott Pruitt, who supported similar cuts in Trump’s 2018 budget proposal, saying he “[believes] we can fulfill the mission of our agency with a trimmed budget.” As new tax cuts for corporations and wealthy individuals take effect, the EPA will be further starved of resources, putting programs such as Superfund—and the health of millions of Americans—at risk. The Trump administration’s budget would slash hundreds of billions of dollars from critical programs that help families put food on the table. This includes a cut of $214 billion dollars over the coming decade from the nation’s largest nutrition assistance program, the Supplemental Nutrition Assistance Program (SNAP). SNAP helped ensure that 21 million households—more than three-quarters of which have children—had enough to eat in 2017 when wages were not enough. In addition, research shows SNAP has far-reaching positive effects on long-term outcomes, including children’s health, educational attainment, and earnings. It also acts as an engine for the economy: Every dollar of benefits spent generates an additional $1.73 in economic activity, and every $1 billion in SNAP spending supports nearly 11,500 additional jobs. Trump’s crippling 31 percent cut to SNAP would come on the heels of his creation of a special tax loophole for pass-through businesses—owned predominately by wealthy business owners such as Trump—which cost nearly twice as much as these SNAP cuts would save. Under Trump’s plan, 5.5 million households would lose their benefits in 2019 alone if Trump’s cut were enacted by taking families off SNAP—and this number would increase to 7.4 million households when the cut would grow to nearly 35 percent in 2028. These estimates are available for all states and congressional districts here and here. What’s more, the Trump budget tightens punishing SNAP time limits, which already exist in nearly every state, for workers who cannot find a job or get enough hours at work. These so-called work requirements do not create a single job—and taking away food from struggling workers will not help them find work faster. Finally, Trump’s budget suggests that it will swap a portion of SNAP’s already modest benefits—which average just $1.40 per person per meal—for a commodities program. This unprecedented step would strip SNAP participants of their ability to obtain the nutritious foods their families need, instead constraining their choices to a limited number of items produced only by certain companies—and opening the door to powerful agricultural conglomerates using SNAP as their personal slush fund by lobbying Congress. This move could line the pockets of Trump-appointed officials in the Department of Agriculture and throughout his administration who have deep ties to industry—including Secretary of Agriculture Sonny Perdue. Compounding the pain of SNAP cuts, Trump’s budget would also entirely eliminate the Social Services Block Grant and the Community Development Block Grant, which would—among other cuts—severely reduce federal funding for Meals on Wheels, a program that delivers meals to low-income seniors, helping them get adequate food and stay in their homes. The budget also proposes to test Speaker Ryan’s so-called opportunity grants, which would slash and combine a range of critical programs that help families put food on the table and keep a roof over their heads in the name of supposed state flexibility. President Trump continues to make housing less affordable and, now, even less accessible and safe. Today, half of all renters struggle to afford the roof over their heads. Due to increasingly insufficient federal funding for housing assistance, as well as rising rents continuing to outpace incomes, only 1 in 5 eligible families in need of rental assistance currently receives it. President Trump’s budget not only diminishes the critical role of the federal government in providing and ensuring safe, affordable housing but also seeks to increasingly abdicate the responsibility to address this national crisis and push it onto already budget-strapped local governments. The budget proposes slashing $8.8 billion in discretionary funding from the U.S. Department of Housing and Urban Development (HUD), an 18.3 percent reduction from the 2017 enacted level. Proposed cuts to HUD’s rental assistance programs—the Public Housing, Section 8 Project-Based Rental Assistance (PBRA), and Housing Choice Voucher (HCVP) programs, which currently serve about 4.8 million households—would likely price more than half a million households out of their subsidized homes. The administration seeks to impose punitive work requirements on all working-age tenants without disabilities, no matter how hard they are looking for work. This new burden would make it particularly hard for female-headed households with minor children to maintain their eligibility in absence of other vital supportive services, such as affordable, accessible, and high-quality after-school and child care programs. In 2017, 40 percent, 30 percent, and 25 percent of families assisted by the HCVP, Public Housing, and PBRA programs, respectively, consisted of single female-headed households with children. The budget completely eliminates the Public Housing Capital Fund, HOME Investment Partnerships Program, and the Community Development Block Grant—which support the repair of badly aging housing stock and the development of sorely needed affordable housing and help struggling families, veterans, and seniors keep their homes. Despite the essential housing aid they provide to marginalized rural, suburban, and urban neighborhoods, the Community Services Block Grant, Weatherization Assistance Program (WAP), and Low-Income Home Energy Assistance Program (LIHEAP) are all slated for complete elimination. LIHEAP helps at least 6 million low-income households—mostly with children, elderly, or people with disabilities—keep their homes at safe temperatures during harsh winter and summer months. LIHEAP costs the government only $3.4 billion—less than the $4 billion in oil and gas giveaways that were maintained in President Trump and congressional Republicans’ tax overhaul. Without WAP, approximately 35,000 households each year will be unable to make home modifications that save money and conserve energy, and 8,500 jobs will be lost as well. Social Security provides essential support to a wide range of Americans, including retirees, surviving spouses and children, and workers who have become disabled. Despite promising not to cut this critical program during his campaign, President Trump’s budget proposes $72 billion in cuts over the next 10 years to federal disability programs, the bulk of which come from Social Security Disability Insurance (SSDI) and Supplemental Security Income (SSI). If enacted, these cuts will do widespread harm to millions of people with disabilities—yet the savings they bring will be less than the cost of Republicans’ just-passed tax cut for heirs of multimillion dollar estates. Trump’s proposed cuts add unnecessary red tape to an already cumbersome eligibility determination process, making it more difficult for workers with disabilities to access their earned benefits. They are also likely to increase poverty and economic insecurity. For example, Trump’s budget includes cuts to SSI benefits for families that include multiple people with disabilities. These cuts could impact more than 1 million households receiving SSI, roughly one-third of which are multirecipient households with at least one child receiving SSI. Households that include multiple children with disabilities are disproportionately likely to be poor and experience material hardship, such as food insecurity, housing precarity, and lack of access to health care. Trump’s proposed cuts would be particularly devastating for rural areas, which have higher rates of disability—betraying the very rural voters who were critical to Trump’s election. The just released budget calls for a catastrophic cut of more than 30 percent to diplomacy and international development programs from 2017 enacted levels. These cuts, if enacted, would leave America more likely to stumble into military conflict; badly undercut prospects for much needed increases in trade and economic growth; and cause untold suffering for millions of people—particularly the most vulnerable women and children in the developing world. The situation on the Korean peninsula remains dangerously close to war, as the president relies on Twitter tantrums rather than diplomacy. The 17-year war in Afghanistan remains no closer to a successful conclusion, and indeed President Trump has expanded the number of U.S. forces on the ground in both Afghanistan and Syria with no clear end in sight. And as the challenges fester, the secretary of state is decimating his own department and, with it, America’s ability to tackle these problems. Secretary Rex Tillerson has slowed to a trickle the admission of new Foreign Service Officers to build the future of America’s diplomatic corps; much of the hiring freeze for the State Department remains in effect; and Tillerson’s actions have been driving out senior career diplomats at an alarming rate. Seven of the top nine jobs at the State Department are currently empty. This amounts to national security malpractice, and a unilateral disarming of a core tool of American power. Cuts in development funding, coupled with deeply regressive policies, are already being felt. The reinstitution of the “Global Gag Rule,” limiting access to family planning for poor women in developing countries, has been catastrophic. As Time magazine notes, “In just one year, health care workers say the policy has had disastrous effect; as expected, clinics are shutting down, unsafe abortions are predicted to rise sharply and families are losing critical services across the globe.” U.S. funding cuts and policy restrictions will lead to millions more unwanted pregnancies and unsafe abortions around the globe. And it is not just those living abroad who will feel the impact of cuts in development assistance. These budgets would leave Americans more vulnerable to sudden outbreaks of infectious disease and other major health threats. For instance, plans to cut by 80 percent the Centers for Disease Control’s work on epidemic prevention overseas could leave a future outbreak of Ebola, similar to the one in 2014, left free to spread to America. The administration’s deep cuts in science and technology, including funding for dealing with climate change, mean that Americans will be more vulnerable to rising sea levels and extreme weather at a time when the country is already coming off of the most expensive disaster season in history. On top of specified program cuts, the Trump budget includes incredibly deep, but unspecified, cuts to domestic programs and investment in later years. The budget slashes nondefense discretionary spending by a stunning 28 percent over the next decade, including 42 percent by 2028. Incredibly, in inflation-adjusted terms, the nondefense discretionary budget would be cut by more than half compared to its 2010 level. The nondefense discretionary part of the budget funds an array of programs including health care, education, job training, medical and scientific research, environmental protection, financial regulation, trade and antitrust enforcement, veterans’ programs, transportation, rural economic development, manufacturing investment, diplomacy and international affairs, law enforcement, and other basic government functions. Cuts of that magnitude would be devastating for the economy and virtually all citizens who rely on government services. The Trump administration claims that the devastating cuts it proposes are necessary to reduce deficits, but the level of deficit reduction in the Trump budget is a mirage. It is based on extremely aggressive economic growth projections that are far out of line with mainstream analysts. The Trump administration claims that its policies will lead to real annual growth in gross domestic product (GDP) over the long run of 2.8 percent—about 50 percent higher than the Congressional Budget Office’s baseline forecast of 1.9 percent and the Federal Reserve Board’s forecast of 1.8 percent. For these reasons, the deficit and debt projections in the Trump budget are fictional and are much higher in reality. Thus, cuts to programs would need to be much deeper than those provided in the budget to achieve any given deficit target. President Trump’s cruel budget lays bare who is paying for his tax cuts for millionaires, billionaires, and wealthy corporations: everyday Americans. In numerous ways, the budget pays for tax cuts by taking away health care, reducing investments that will create opportunity and grow the economy, and slashing programs that help families afford the basics—the very opposite of what the American people want. It is clear that while the president and Republican Congress did everything they could to look out for their donors and themselves, they are willing to enact devastating cuts to programs that the rest of America depend on. Seth Hanlon is a Senior Fellow at American Progress. Rebecca Vallas is the vice president, Rachel West is the director of research, Katherine Gallagher Robbins is the director of policy, Rejane Frederick is an associate director, Eliza Schultz is a research associate, and Heidi Schultheis is a policy analyst for the Poverty to Prosperity Program at American Progress. Kevin DeGood is director of infrastructure policy, Angela Hanks is director of Workforce Development policy, Michela Zonta is senior policy analyst for Housing and Consumer Finance Policy, Annie McGrew is a research assistant, and Alex Rowell is a policy analyst for the Economic Policy team at American Progress. Thomas Huelskoetter is the policy analyst for Health Policy at American Progress. Erin Auel is a campaign manager for Energy and Environment Policy at American Progress. Stephenie Johnson is an associate campaign director of K-12 Education at American Progress. Ben Miller is the senior director and Antoinette Flores is senior policy analyst for Postsecondary Education at American Progress. Alan Cohen and John Norris are Senior Fellows at American Progress.